Last May I had the opportunity to visit Susan Martin Maffei and Archie Brennan in their studios in New York. It was one of those experiences that is hard to share partly because it can’t be translated well in words and partly because I treasure it so much in my heart that talking about it just doesn’t seem to bring the experience justice. But I’ll give it a go anyway. I was in New York because flying into Albany is the best option for me when I teach my yearly tapestry retreat in Plymouth, Vermont. It turns out that Susan and Archie don’t live all that far south of Albany and I invited myself over for a chat before I headed to Vermont. We had such a great time that they allowed me to come back before I flew out again a week later. Susan has produced a beautiful artist book and I came home with a copy of it. 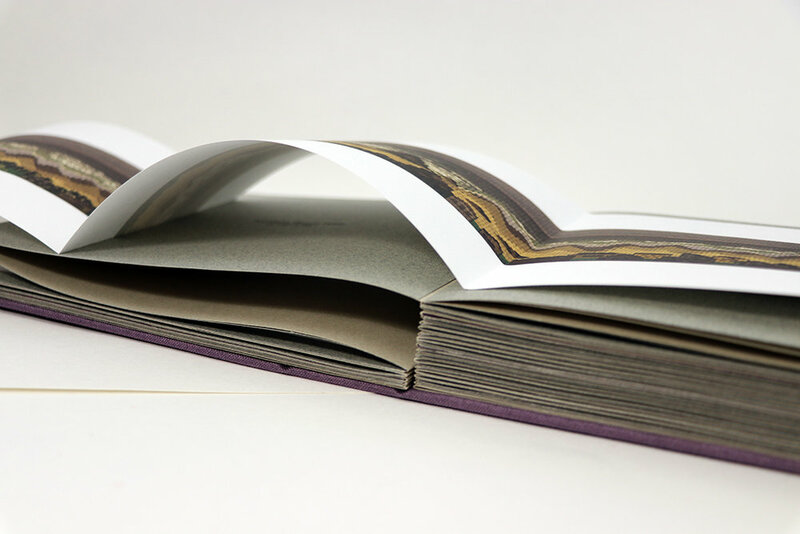 It is an accordion book which is just stunningly put together. It has fold-outs of many of her scroll tapestries. She also showed me some of her recent ones which I can’t share here, but I can share a couple images of one of her older pieces. She has series of these scroll pieces about landscape, sports, and travel. The images below are from a Sports Series piece, Day at the Races. I love how she puts together small images to make a pattern. Often she’ll depict a crowed from above as you can see at the bottom of this piece. Her travel series has long been an inspiration for my own tapestry diary. She made several studies with tiny tapestries as she rode across the USA via train. In a very tiny weaving (less than 2 inches square), she is able to simplify an image and still get across a feeling or flash of a form. Aggregating those tiny flashes results in a work that makes you feel like you are on a journey with her. This artist book is gorgeous. It is precisely constructed with wonderfully reproduced images—all fold-outs to accommodate the narrative length of the work. It has been inspiring me for six months now and I felt it was high time to share it with you. Susan showed me her current work. 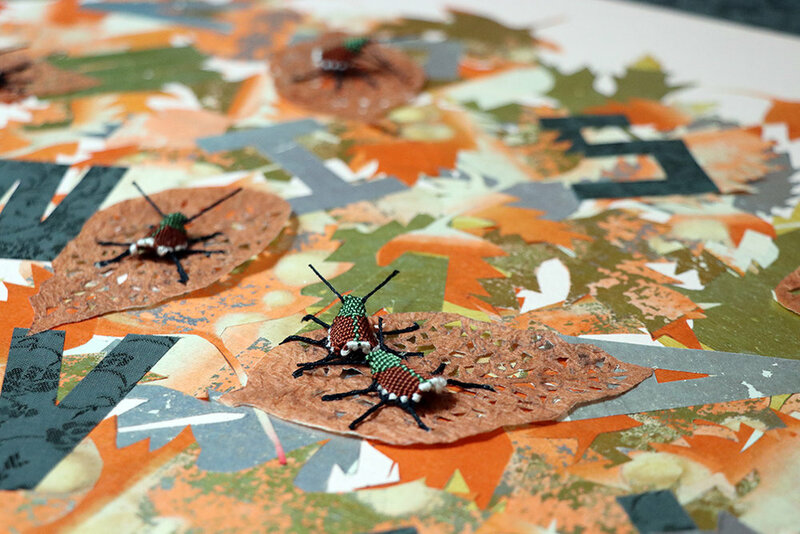 I was fascinated by the boxed insect pieces. Incredible, intricate work displayed in fantastic sculptural ways. Keep your eyes open for this work in shows in the future. She has a sneak peak on her website HERE. You can find more information about her book and possibly order a copy yourself HERE. She also has information and teaching on the website she maintains with Archie Brennan HERE. I will include one photo from her current work because she has since posted a similar one on Instagram. I found this work incredibly detailed, powerful, and inspiring. It is amazing how fascinating invasive insects can be! I loved her scrolls of beetles also. And then there is Archie. I was a bit star-struck, I’ll admit. Somehow over the last decade, the planets had never aligned for me to study with Archie and Susan and now Archie doesn’t teach anymore. So this opportunity to sit down and ask him questions was so much fun. I had interviewed Archie and Susan via telephone for an article in the Spring 2015 issue of Fiber Art Now. I had gotten a flavor for their style, humor, and beliefs about the art form back then. I wanted to build on that knowledge with some time in person. If you don’t know anything about Archie Brennan and you’re a tapestry weaver, it is high time you did. You could start with THIS online exhibition by the American Tapestry Alliance. He started his tapestry career as a 16-year-old apprentice at the Dovecot in Edinburgh. He became a master weaver, completed various other educational tracks, became Director of the Dovecot and also a professor at the Edinburgh College of Art. He helped the Australian Tapestry Workshop (then the Victorian Tapestry Workshop) get started and he moved to the USA in the 1980s where eventually he met Susan. They were a powerhouse teaching team for decades and their work has been featured pretty much everywhere. 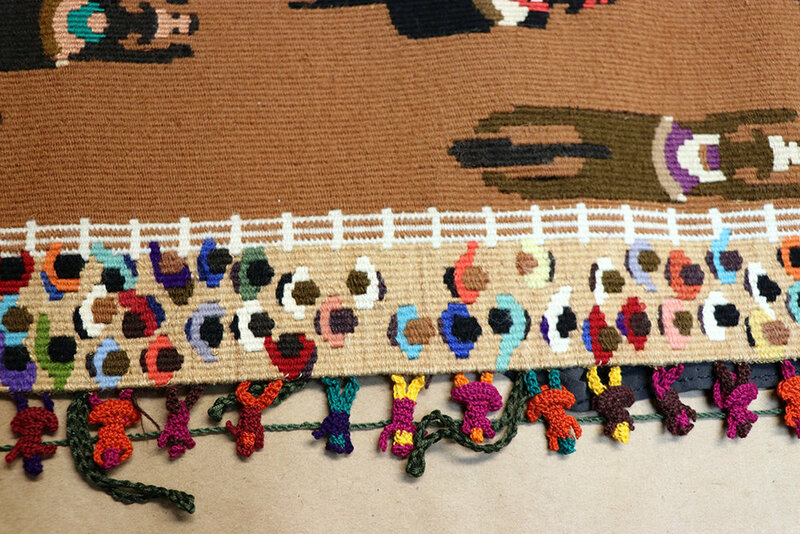 I don’t think it is an exaggeration to say that Archie Brennan had a major hand in making tapestry weaving what it is today. The shift from a medieval reproductive medium back to an artistic medium in its own right was something he helped catalyze. 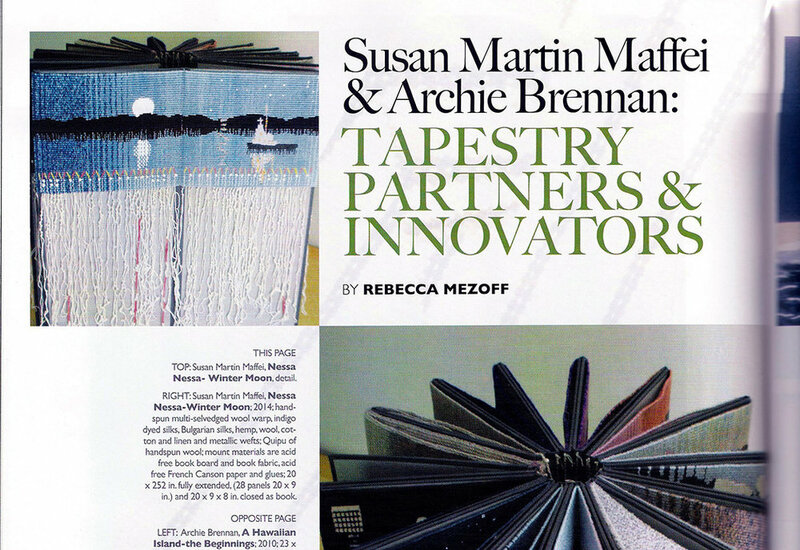 I often cite both Archie and Susan’s work as examples of tapestry weaving worth studying. If you ever get a chance to meet, listen to a lecture by, or study with either of them, do not pass up the opportunity. 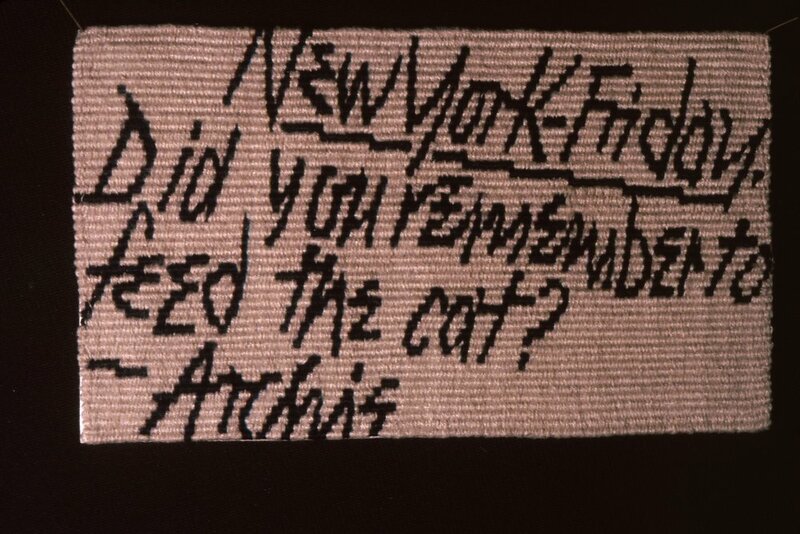 Perhaps this statement in that American Tapestry Alliance online exhibition will inspire you to read what you can find about Archie. You can find the whole thing HERE. Quite simply the practice of woven tapestry has been an obsessive passion my entire adult life. It is my creative language, and I love-hate-delight- and struggle with it each day, all day. In a unique manner it is a vehicle to convey concept, comments, harmony, discord, rhythm, growth and form. Simply put, it is what I do. That tapestry today is widely regarded as a minor art form leaves me unconcerned. This is someone else’s problem. In medieval Europe, pre-Columbian Peru and Coptic Egypt, tapestry was supreme. Five hundred years ago it was already extremely sophisticated- aesthetically, technically and in diversity of purpose. Today its lack of defined purpose – its rarity – gives me opportunity to seek new roles, to extend its historic language and above all to dominate my compulsive drive. When I interviewed Archie in 2015 he said he had just finished his 503rd tapestry. He has woven some since and indeed has a tapestry on the loom right now. His studio is full of tapestries and copper pipe looms and if he is there himself, an unending stream of great stories. Archie has a marvelous sense of humor and I loved laughing with him while listening to stories of everything from Princess Di to his work in mosaic in Papua New Guinea. Archie has a huge body of work, but maybe this simple postcard will endear you to him as much as it does me. He has woven postcards throughout his career and almost all of them make me smile. If you are unfamiliar with the work of Susan and Archie, please take some time to visit the links here and make some links of your own. Do you have any stories about times with Archie or Susan? Perhaps you had a workshop with them or knew them in NYC or earlier? We’d love to hear them in the comments. My very first workshop was with Archie in the New York Studio of Ruth Scheuer in 1984? We set up a three inch wide warp at 8 ends and the object was to weave first letters and later faces. Archie was always wanting every detail to be exact. At that scale there is a lot of decision making to decide where each weft should be placed. It was an exacting process and ultimately very satisfying.